The Philippines is participating in Expo 2012 Yeosu for the tremendous potential. Its theme highlights the archipelago's inherent natural bounties in coastal and marine resources. To best communicate the Philippine statement - "Islands of Diversity, Seas of Connectivity," and country brand - "It's more fun in the Philippines", the multi-sensory pavilion employs audio-visual presentation for its main exhibit that simulates a journey through the islands coastal and underwater treasures. Manila - Yeosu - Manila includes round-trip airfare on Economy class via PR (Manila-Incheon-Yeosu*), 4 nights accommodation with breakfast inside hotel, 2 days expo pass, tours and transfer service. Package price is USD 1,450 per person. 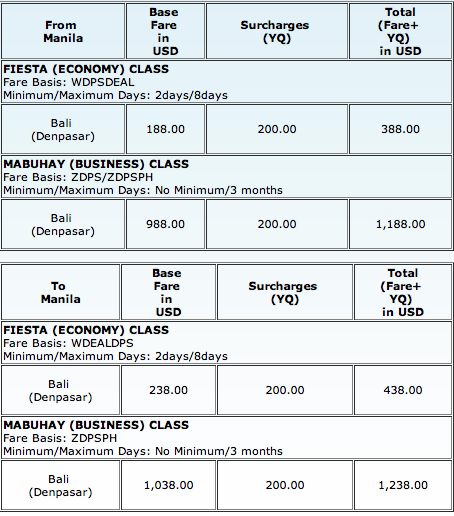 Price includes surcharges and Philippine Travel Tax (PHP1,620). Time to Visit Hong Kong! Come join Hong Kong Ocean Park's 35th anniversary celebration! Buy Philippine Airlines ticket of any class on Manila to Hong Kong to Manila flight until 30 June 2012 and enjoy some amenities in the park thru purchasing it from Philippine Airlines ticket offices. Valid for travel from 01 June to 15 July 2012. Admission ticket is available for sale in the Philippines. Enjoy this promo for flights from Australia to Philippines. Book and buy through www.philippineairlines.com using MasterCard, Visa or JCB credit card. You may also purchase tickets at PAL ticket office or visit your nearest travel agent. I bet you are looking for some special promos now from PAL! Well, you are so lucky!!! Mind the travel dates. This promo is good for travel from June 13 to September 30, 2012. So if you are attending or planning something on those dates, then this is your perfect opportunity already! PAL's special sale treat to our passengers going to domestic destinations! Valid on PR operated flights only! Are you planning to go somewhere in ASIA? Is Bali, Shanghai, Jakarta, Tokyo, Macau, Hongkong, Bangkok, Singapore, Osaka, Xiamen just part of your travel itinerary? Or you want to visit Melbourne, Guam, Delhi, or Sydney? Then definitely, you should check these promos for you. Enjoy this promo for flights from Manila/Cebu to selected PAL online points. Valid for sale from 18 to 22 May 2012 only. Book and buy through www.philippineairlines.com using MasterCard, Visa or JCB credit card. Check this out for PAL Corporate Circle! If you are a corporation and would like to avail some promos and discounts, this is for you! Be one of the elite and join PAL Corporate Circle’s growing family of 2,000 top corporations in the industry. Registration is hassle-free. Simply accomplish the registration form and forward to PAL Corporate Sales for profiling. No set of qualifications and/or eligibility requirements are necessary. And as an added service, submission of the registration form automatically includes you to email blasts of the latest products and services of PAL. As a full-service carrier, PAL now has special promos and travel packages customized to companies with employees requiring frequent travel, either individually or as a group, and complemented by PAL's frequent flyer rewards program and world-class cabin service. The list of corporate clients continues to grow, indicating satisfaction with PAL's new concepts and product enhancements exclusively designed for frequent flying companies. To know more how your company can avail of the special corporate program, get in touch with the PAL Corporate Sales Team. PROMO FARE 2012: The sun shines brighter at our newest destination. Starting April 28, 2012, we're flying straight to Bali. Book and buy through www.philippineairlines.com using MasterCard, Visa or JCB credit card. You may also purchase tickets at Philippine-based PAL ticket office or call our Manila reservations office at tel. no. (632) 855-8888 or visit your nearest travel agent. 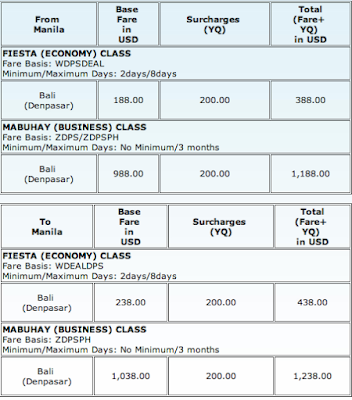 PAL Promo 2012-Why travel alone? Book a flight to Bangkok, Ho Chi Minh, Jakarta or Singapore at US$96 roundtrip for two! Add US$7 and tag along another buddy for more fun! Outbound travel is from February 7 to March 21, 2012. Surcharges and taxes apply. Click the link below for more information. Book your flight or get a fare quote at www.philippineairlines.com. For every business class ticket you buy, get another one for FREE for your loved one. Valid on PR-operated services only. Book and buy through www.philippineairlines.com using MasterCard, Visa, JCB debit/credit card or BancNet ATM card or My ePrepaid MasterCard. The base fare for the second ticket is FREE. The surcharges and estimated taxes above shall apply. The FREE ticket must be redeemed at any Philippine-based PAL ticket office or contact center on or before 13 February 2012. Terms and conditions apply. This offer is valid only for sale in the Philippines (PAL ticket offices and travel agents), and in the Philippine Airlines website. Before Departure - Refund is permitted. Charge PHP1,000 Refund Service Fee per ticket. Both tickets must be presented for refund. No SHow Fee applies at PHP400. Note: Infant without seat shall not qualify as companion. Child is considered as companion for the love fare. 2012 PAL Promo: Purchase any of the love fares and fly in style with PAL and get a chance to win a romantic escape for two (2) to the US with the PAL Valentine Broadway Experience. Fares are INCLUSIVE of surcharges and estimated taxes. Philippine Travel tax, other airport fees and charges are not included. Book and buy through www.philippineairlines.com using MasterCard, Visa or JCB credit card. You may also purchase tickets at Philippine-based PAL ticket office or call our Manila reservations office at tel. no. (632) 855-8888 or CEB reservations number (032 3400191) or visit your nearest travel agent. Rebooking is permitted at USD100 per ticket (per transaction). No Show Fee applies. Refund is permitted for totally unused tickets at USD100 per ticket. Both tickets must be presented for refund. No Show fee applies. Partially used tickets are non-refundable. Fare and surcharge are non-refundable. Child/Infant fares: Infant without seat: Charge 10% of the applicable adult love fare. Infant with seat: Charge 75% of the applicable adult love fare. Note: Infant without seat shall not qualify as companion. Child: Charge 100% of the applicable adult fare. Note: The child is considered as companion for the love fare.